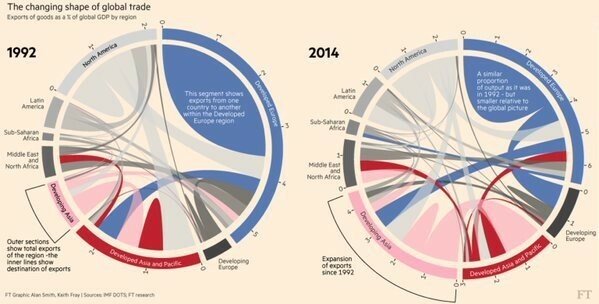 Developing economies now play a much bigger part in the flow of trade around the world. If you’ve ever doubted the increasing role of developing economies in global trade, this graphic from the Financial Times will change that. Compared to a quarter of a century ago, developing economies now play a much bigger part in the flow of trade around the world. This expansion has been felt most keenly in developing Asian economies, as their exports have grown significantly over the period. A larger version of the graphic is available here. The wheels show both exports of goods as a percentage of global GDP, and also the final destinations of these exports. The increasing importance of developing economies is clear. All emerging regions have made gains over the period and nowhere is this expansion more obvious than in Asia. A World Trade Organisation report illustrates “the conjunction of technical, institutional and political changes” that have developed trade networks across East Asia. Globalization, as developed economies took advantage of the supply potential in the developing world, has also played a significant role. The spreading of production across the world – or ‘global manufacturing’ as the WTO term it – has changed the very nature of international trade. The chart also highlights the significance of exports within Asia. The role of trade agreements such as the Association of Southeast Asian Nations Free Trade Area is likely to have been an important driving force behind this. Interestingly, by 2014, inter-regional European trade had become smaller relative to the global situation. The destinations and origins of trade in Europe had also become much more international. 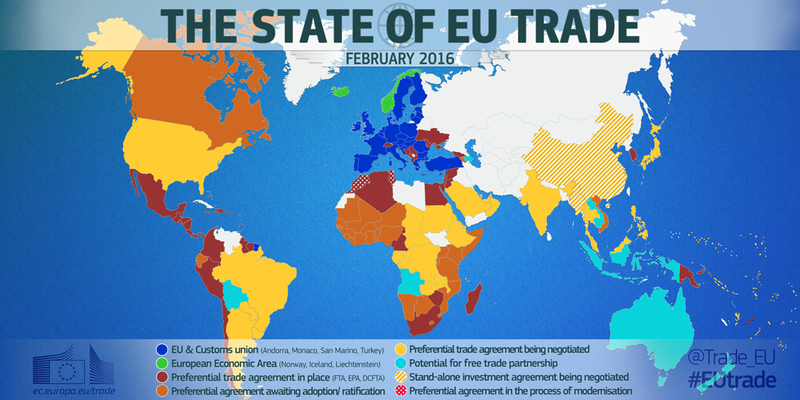 As this map emphasizes, the EU is negotiating, or has in place, trade agreements with nations across the world. Sub-Saharan Africa and Latin America have also seen growth, alongside the Middle East and North Africa. The World Economic Forum’s E15 Initiative has emphasized the importance of efficient global trade in fostering economic growth. 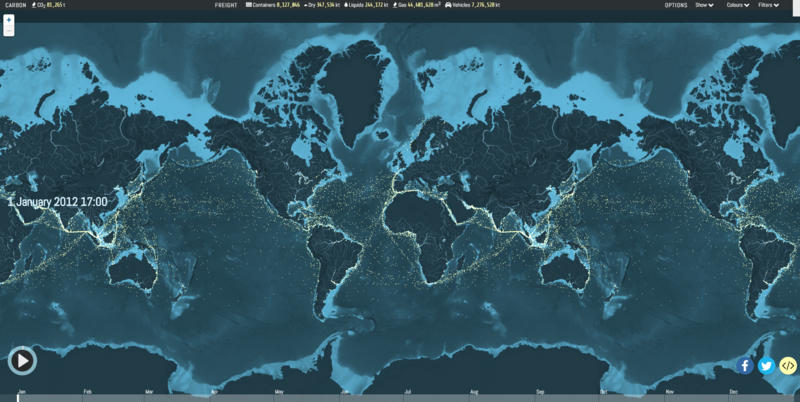 The scale and complexity of the modern, globalized, system is made clear by visualizations such as these, of global shipping. As developing economies increase their volume of exports around the world, they too can take advantage of the economic benefits of efficient trade. Ensuring everyone has a seat at the trading table can therefore help encourage sustainable development and inclusive growth.